In August, the United Nations argued that Trump's "strategic" attacks on the media will increase the risk of violent attacks against reporters but the president has largely ignored the warning. "Fortunately our cameraman is fine, he is made of stern stuff", he told the Today programme. Jorge Salgado, a photographer in attendance, also shared footage from a different angle. 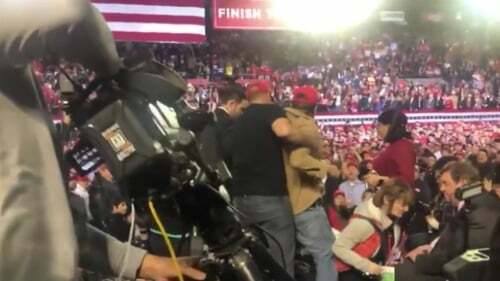 He said a Trump supporter mounted the press gallery and pushed the camera into his colleague, then pushed Skeans, in the middle of the president's rally. The attacker is shown screaming "f**k the media" before he was ushered away by security personnel. "We are relieved that, this time, no one was seriously hurt", wrote Knox. Correspondent Gary O'Donoghue shared footage of the attack, saying it followed Trump's "goading" of the crowd against journalists and others he considers opponents. "Ron Skeans was violently pushed and shoved by a member of the crowd while covering a President Trump rally in Texas last night". Speaking on the altercation, British Foreign Secretary Jeremy Hunt told Sky News that "it is never acceptable when journalists and cameraman are attacked just for doing their job". Trump has had a contentious relationship with reporters throughout his presidency and previously referred to the media as "the true enemy of the people". Late Monday, however, lawmakers said they reached a bipartisan agreement though it's yet to be seen if Congress will approve it and if the president will sign the deal. The man was removed by security, and Trump reportedly "checked" with the crew to make sure everything was okay. As The Washington Post's Philip Rucker and others reported, Trump spoke for about 75-minutes Monday, attempting "to paint an image of crime and lawlessness on the border while claiming falsely that violent crime went down in El Paso after a wall was built". Harassment of the media has been a regular thing at Trump rallies since the 2016 campaign.